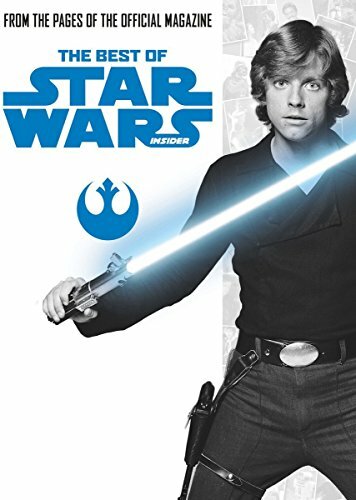 This is a glossy, magazine-sized collection of interviews, a few articles, behind the scenes discussions, and a lovely what-if Q&A at the end that paints a fun and interesting picture of the place and time when the original trilogy was made. The interviews with Mark Hamill, Carrie Fisher, and Harrison Ford all took place before the first movie came out, when they were young and not yet superstars. Many of the others took place after, and the consensus from both sides of the release seems to be that when they were making A New Hope, no one had any idea how big it would become. The book is mostly a delightful look at the things that often get overlooked in such a big franchise. The people who designed the ships. The people who painted the backgrounds. The people inside the droids. There's discussion of Lucas' process and some of the plans he had that never came to fruition or were reused somewhere else because they were cut. There's a segment from Warwick Davis about being an actor on the various sets and how to make the best of it. There's cover art and dozens of photos. There's a transcript of the discussions Lucas had with Alan Dean Foster before the first Star Wars novel, Splinter of the Mind's Eye, was written. The glimpses they show—into the way everyone thinks about the story and how different people have different takes that have to be balanced—are golden. The articles, none of them very long, are obviously from people who love the franchise, but they're admirably even handed, balancing the fannish love of detail with the honesty the actors and creators deserve. It's a little like looking at old photo albums, reading the older articles, seeing how someone used to be and what they originally brought with them before they were so completely identified with the stories and characters and skill sets that made them stars. Often, the most interesting articles are the ones about how things got done rather than what happened—the way sets and costumes got designed, how problems were solved and ideas executed, the smallness of Industrial Light and Magic in the beginning, how young and fresh and excited everyone was for this movie they loved and believed in, but didn't expect to do much. There's even some small discussion toward the end about whether Vader was actually redeemed. The book won't take long to read; if you linger and enjoy it, maybe a few hours. It's informal and conversational. It's fun. But it's packed with information, behind the scenes stories, different perspectives on the creation and reception of the movies, and all sorts of facts and details for any fan. The Best of Star Wars Insider draws a charming portrait of a group of people who changed science-fiction movie making. And it joyfully fleshes out the real world this amazing fictional world comes from.